Anastasia Figuera/Contributing Photographer The 15th annual Playwrights and Artists Festival, which concluded last weekend, featured six original plays from local writers. 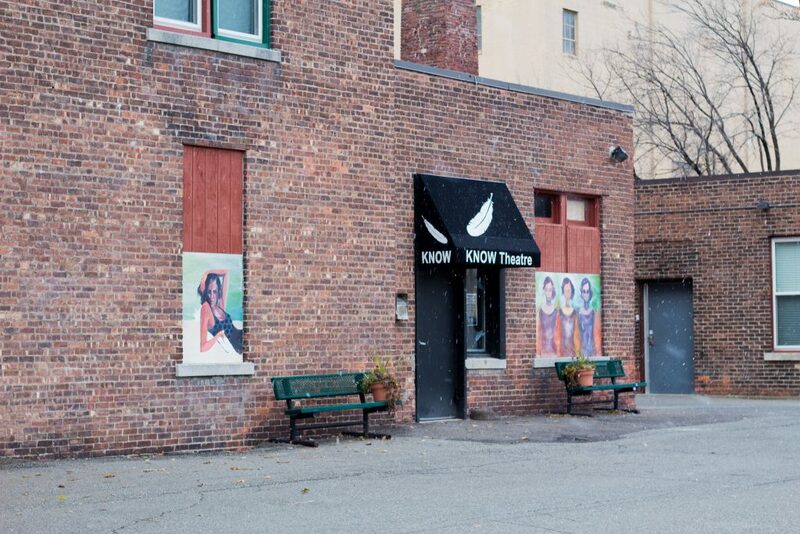 The 15th annual Playwright and Artists Festival recently concluded at the KNOW Theatre in Downtown Binghamton. The festival asks its playwrights to compose their submissions based on a different work of art each year, ultimately choosing six submissions to produce. For the weekends of Nov. 16 and Nov. 23, KNOW Theatre produced a total of six 20-minute plays written by local playwrights. Friday night’s plays, “Out of the Rubble” by John Shea and “A’Driftin’” by Jim Haswell, were inspired by Karl Schadlich’s painting, “Rockport, Mass.” Haswell’s play follows a middle-aged woman’s contemplation on her childhood home, while Shea’s play centers on a young girl and her older guardian who saved her from the shipwreck that killed her parents. The music scoring the plays also has a local spin, being composed by Broome County resident James Wright Glasgow to suit both works. “A’Driftin’” was directed by Tim Gleason, artistic director of KNOW Theatre, and centers around Angie Ronan, the young girl, and her guardian Garth Meredith, in their house on the shore as a school official fights to remove her from his custody. As Angie’s school is closing, Garth must decide how the girl will continue her education amid the custody battle. Within 20 minutes, the company produced a heartfelt and sincere production with few props or cast members, letting the actors’ portrayals really shine through; Garth’s character was particularly sincere in creating a down-to-earth and realistic struggle. “Out of the Rubble” was directed by Zachary Chastain and featured only two characters: Gloria, a brooding, reflective woman, and Peter, Gloria’s partner who maintains a more optimistic outlook. The play focuses on Gloria’s relationship with the house she grew up in and her memories of her drunken father that are inseparable from her ideas of her home. She recalls her childhood experiences in the house, and although she is gloomy for the majority of the play, at the end, the audience sees her reconcile with her past and seems to be able to appreciate the home as well as the memories she has there. Throughout the play, Peter plays off the leading lady as he looks to the bright side of every memory. The directors and actors had freedom to make revisions to the play as they saw fit, which Jean Graham, who played Gloria, did in “Out of the Rubble,” adding scenes in which Gloria uncovers her grandmother’s old chair and reminisces upon it, cherishing the memories the antique furniture brings back. Each year, Gleason has maintained an atmosphere of encouraged feedback and transparency, as the audience has a discussion with the creative team and actors. This interaction fosters a connection between those involved in the plays and the local community, enforcing a tone of cordiality and a freedom of discussion.